Djpod is a podcast hosting service focused on high quality service, listening to its customers in order to provide a perfect service. After a year of development, we are proud to introduce you what looks like your new podcast hosting. 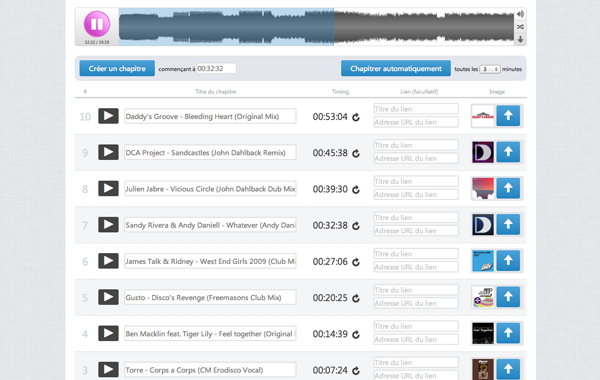 On your page, your audience can listen to your episodes, comment it, add it to their favorites ... Everything is done easily and intuitively, and your page is embellished by the Djpod player where your episode is represented by a waveform. 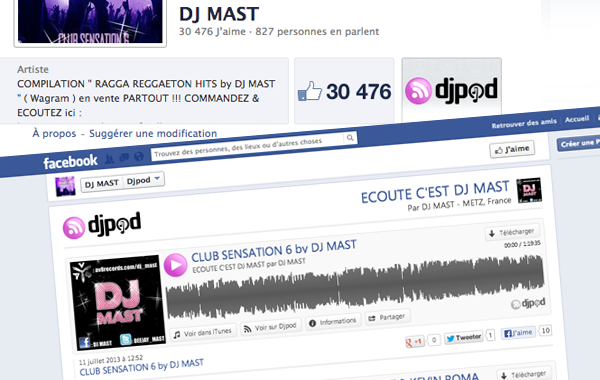 You can also create links to your social networks and other sites (Facebook, Twitter, Soundcloud, Beatport, etc). 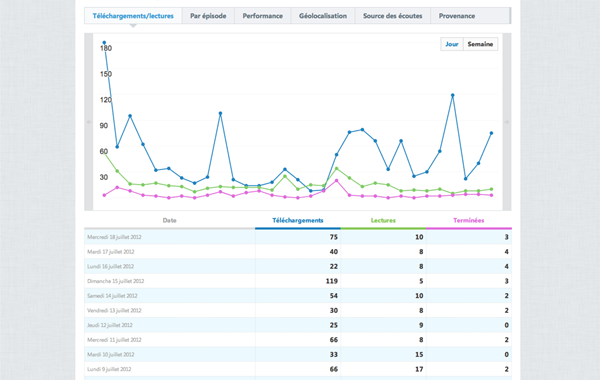 Track the number of downloads day after day. Our powerful geolocation tools allow you to know in which country your podcast is more successful, but also to see the details by region. So you can locate your audience to a level of detail never reached. 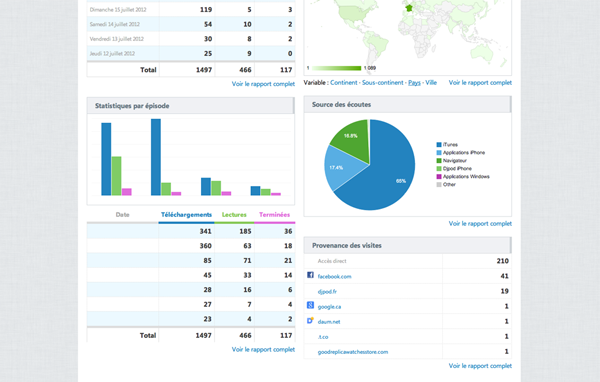 You can track your statistics in real time. 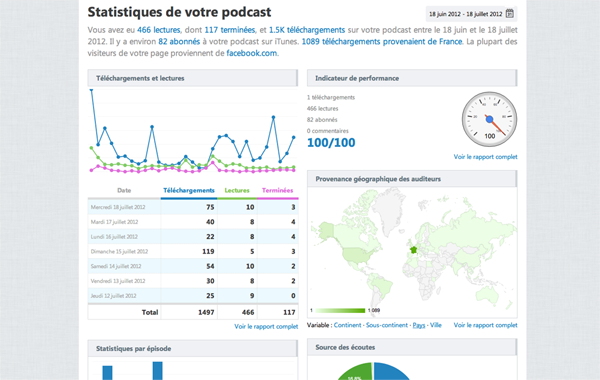 Numbers increment live before your eyes according to the current activity on your podcast. 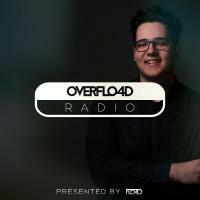 This is exclusively on Djpod, you will not find this anywhere else. Our Facebook app can install a Djpod tab on your Facebook page. With this tab, you optimize your chances of reach new listeners. The Facebook application also allows you to easily connect to your podcast, and inform your fans when a new episode is published on your podcast, fully automated. Admin your podcast is accessible from any page by hovering the item Admin your podcast, so you can access your podcast dashboard at any time. It summarizes everything you need to know about your podcast: the use of your storage, your plan, your picture, and links to the different sections of dashboard. 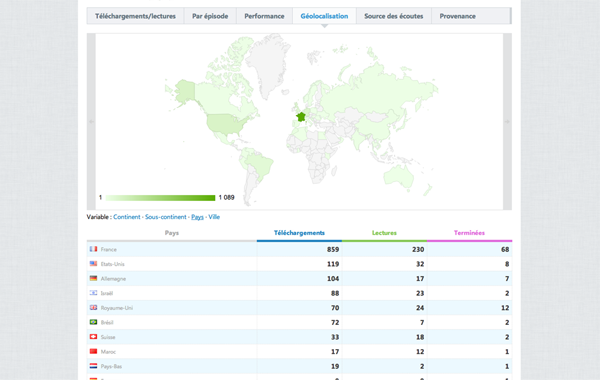 Thanks to our player, your podcast can be embeded and played everywhere. 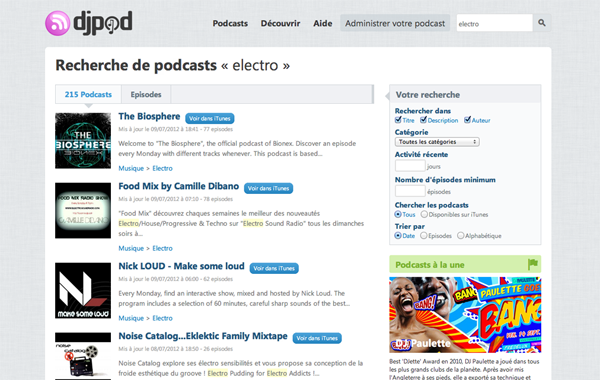 Your listeners can comment your podcast in the player, share it on their social networks, etc. 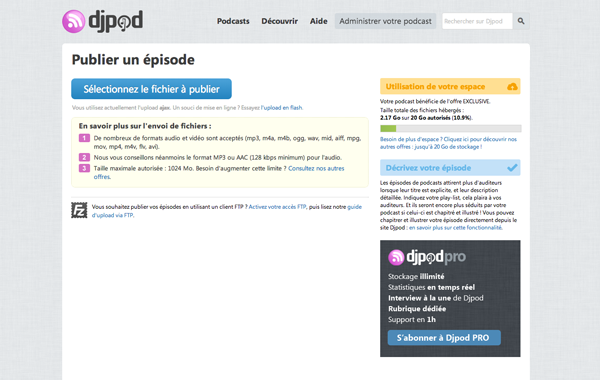 With a few clicks, you can completely change your your podcast page layout. If you lack inspiration, you can find what you want among our many predefined layouts. You can instantly publish an episode, or schedule it at a later date: it will be automatically published at the chosen date! We offer a unique tool that allows you to chapter your podcast online. You define the beginning and end of the chapter, choose a picture, add a link ... all this from a simple web page. The result will be an enhanced episode, chaptered and illustrated, worthy of the greatest podcasts. Many criteria are available to find podcasts that interest you: category, iTunes availability, podcast update frequency ... and so many others. Unprecedented in research: looking directly into episodesith unusual criteria: duration, bitrate, type of episode ... you will surely find what you are looking for. 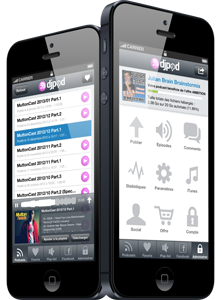 Upload an episode with the app: you do not have time to upload your last episode before leaving home? 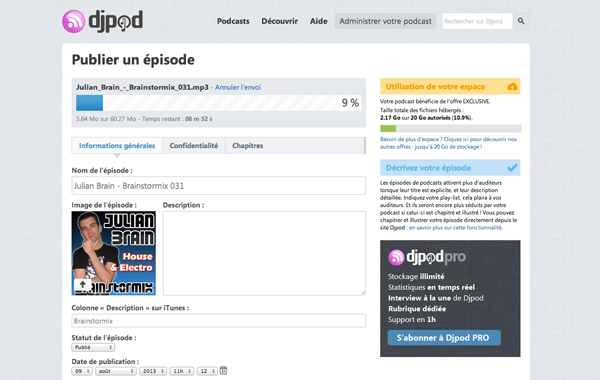 You do that later, from anywhere, with the upload function built into the Djpod app. 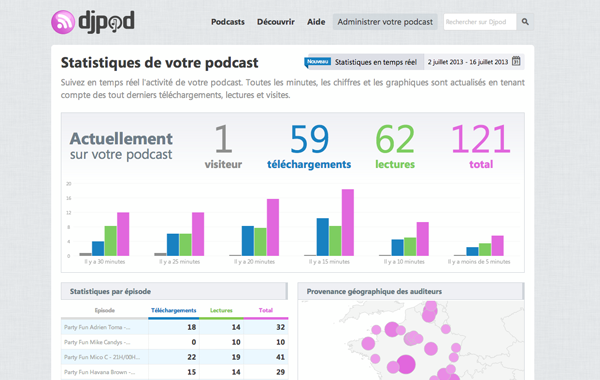 Keep track of your podcast: all statistics are also available on your iPhone: geolocation, evolution per episode, etc.. Everything looks easy with charts. 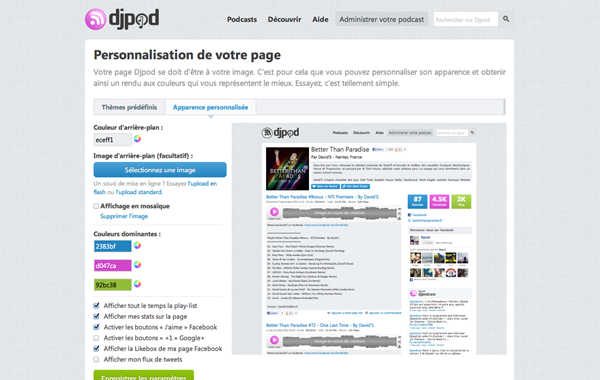 Create a podcast : You will try the many features of Djpod.